SIBO (Small Intestinal Bacterial Growth) - What Is It? It wasn’t too long ago that most gastroenterologists would dismiss chronic digestive problems that couldn’t be identified with a colonoscopy and tell patients that it is “all in your head”. Now, we have started to realize the importance of a neglected organ, the microbiome, and its link to many diseases including IBS and SIBO. In the case of SIBO it is a problem of too much bacteria in the wrong place, the small intestine. 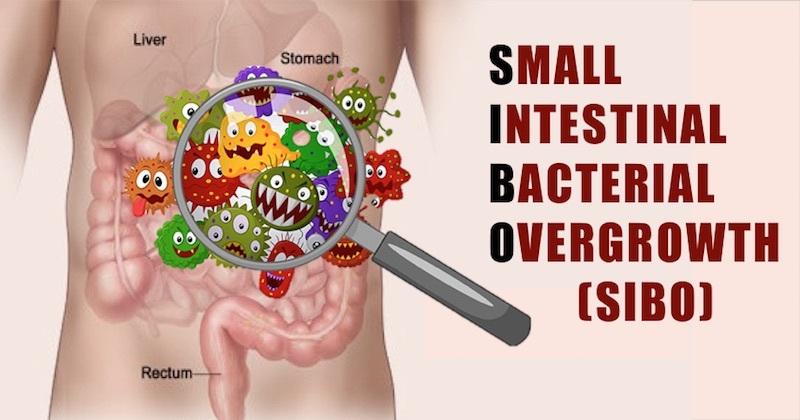 SIBO (small instestinal bacterial overgrowth) is a dysbiosis or overgrowth of bacteria in the small intestine. It’s important to remember that bacteria is normal in the digestive tract and provide many necessary functions for our body. With SIBO, the problem is not the bacteria but that there is too much bacteria or the wrong type of bacteria in the wrong place. A lot of times this can be confusing, but just remember that the small intestine usually has lower counts of bacteria and their main function is the absorption of essential nutrients from food, not excessive fermentation. In the case of SIBO, bacteria is overgrowing and getting in the way of nutrient absorption because of issues with the small bowel cleaning function. How Do You Know You Have SIBO? SIBO can cause a lot of debilitating symptoms and is associated with many other medical conditions. It can also cause absence from work and psychological issues like anxiety and depression. You can see a full list of symptoms and associated diseases here. The terminology can often confuse people. SIBO stands for small intestinal bacterial overgrowth and IBS stands for irritable bowel syndrome. Irritable bowel syndrome has always been the common diagnosis for people who have chronic bowel problems but show no signs of inflammatory bowel disease on scans. Both of the terms are now used interchangeably because research has found that SIBO is often found in up to 60% of patients who are diagnosed with the more general term IBS. Basically, SIBO comes from the new wave of research that has showed that in the majority of patients with IBS there is an overgrowth of bacteria in the small bowel due to the dysfunction of the gut. This is why SIBO and IBS can often times mean the same thing. On the other hand, it is possible to have SIBO or IBS on its own. SIBO can exist when any other condition in the body allows for bacterial overgrowth in the small bowel. For example, adhesions, pseudo obstruction, narcotics, diabetes, and anything that slows down the flow of the small bowel allowing bacterial buildup. IBS can also sometimes exist without SIBO. This is usually when someone has less severe symptoms and has food sensitivities or occasional bouts of constipation or diarrhea. From my experience, in most cases the people who have SIBO often times have more severe digestive issues because of the overgrowth of bacteria which causes a lot of gas, bloating, and uncomfortable digestive symptoms. It’s important to understand the normal functions of the digestive system so you can understand what goes wrong in the case of SIBO. When you eat food, it passes through a number of different tubes where food is broken down, absorbed into the bloodstream to supply energy, and waste is excreted in the form of stool. Mouth: Saliva is secreted and chewing starts to break down food into smaller particles. Esophagus: Transports food into the stomach after swallowing. Stomach: When food reaches the stomach it plops on the left hand side of the stomach and is further broken down with acids and moved with muscles. The shorter right hand side of the stomach is used to move water through. Small Intestine: Final breakdown of food takes place here. Food mixes with digestive enzymes from the pancreas and fat solvents from the liver also known as bile. These pieces of protein, fat, and carbohydrates which are broken down are then ready to be absorbed by the gut wall into the blood, and pumped to the body cells. 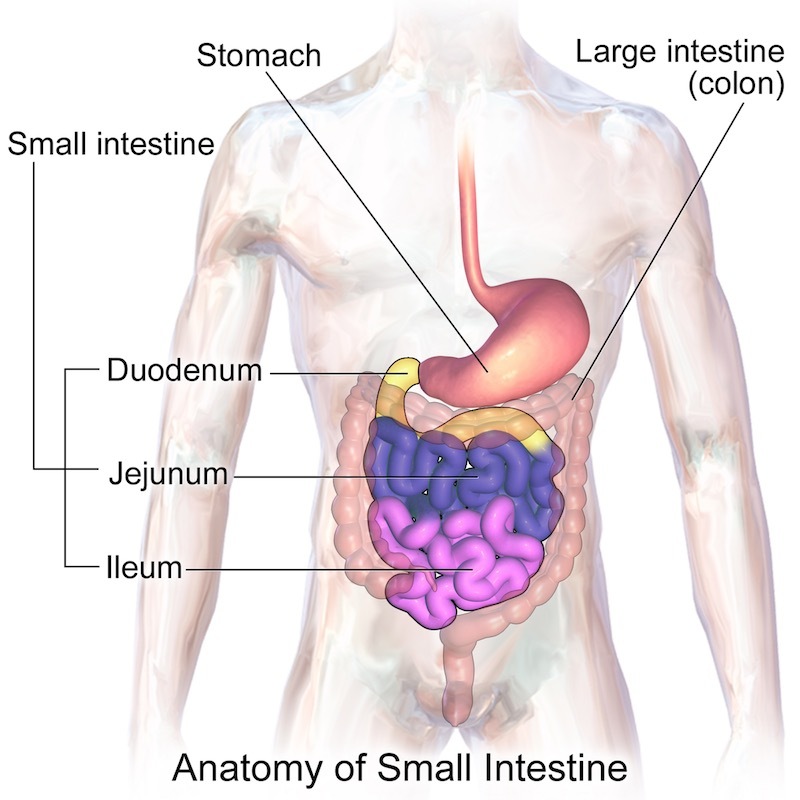 The small intestine is so long, it is labeled by three different sections from top to bottom: Duodenum, Jejunum, and Ileum. The small intestine if studied closer, is a fascinating organ. It is about 10 to 20 feet long and weaves around in our abdomen. It moves when we move our body and it is moist and pink. One other thing to note is that most people don’t realize that only the end of the large intestine has anything to do with stool. The other parts of the intestine are surprisingly clean. The small intestine is made to offer us as much surface area as possible for digestion and contains many folds. It is made up of folds, villi, and microvilli which help absorb nutrients. The small intestine is the star of the digestive process. It is here that our foods are broken down into their smallest particles, absorbed into the bloodstream, and pumped to our body for energy and nutrition. We want this process to work normally. In the case of SIBO, this process is disrupted because the overgrowth of bacteria competes for nutrients and doesn’t allow our small intestine to absorb nutrients normally. Large Intestine: Takes care of indigestibles that cannot be absorbed in the small intestine. This is home to most of our gut bacteria which can break down the last nutritious substances for us. The large intestine and its flora also provide us with an extra helping of fatty acids, vitamin K, vitamin b12, thiamine, and riboflavin. In the final three feet of the large intestine, our water and salt levels are fine-tuned. Lastly, indigestible waste, water, and bacteria form stool and it is pushed out of the body during a bowel movement. Related reading: Understanding the Anatomy of The Gastrointestinal Tract And Its Functions. There are many different reasons SIBO can occur. Something else in the body has to go wrong in order for this dysbiosis in the small intestine to happen. While bacteria is normal and healthy, excessive amounts of the wrong kinds of bacteria in the small bowel is not normal. Dysmotility: Cleansing waves in the small bowel which sweep bacteria and undigested materials down are damaged allowing SIBO to occur. Structural Issues: Adhesions, kinks in the bowel, cut nerves, obstructions. Broad Spectrum Antibiotics/Gut Flora Disruption: Overuse of broad spectrum antibiotics which allows bacterial dysbiosis. Failed Natural Protections: Low stomach acid, weakened immune system, pancreatic insufficiency. Stress: While stress is not found to be a direct cause it can contribute to the problem because stress decreases motility of food and proper digestive processes. A lot of the time people who struggle with SIBO have issues with malabsorption and vitamin deficiencies. They struggle to eat a variety of foods because the bacterial overgrowth feeds on highly fermentable roughage like broccoli, cauliflower, beans, and other fermentable carbohydrates. This can be an issue because it leaves their body starving for vital nutrients we get from fermentable plant-based foods. 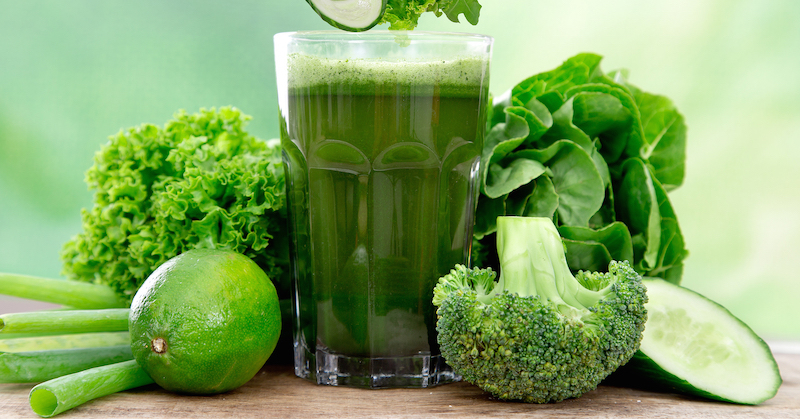 In my experience eating with this digestive condition, I have found pure green juice to be an amazing source of nutrition which is rapidly absorbed. It also allows people with digestive problems to get a small amount of insoluble fiber into their diet which can help with constipation. In the case of SIBO, the quick absorption of nutrients from green juice can allow people who struggle with malabsorption to get essential nutrients. One important thing to remember is that most people with SIBO cannot tolerate much fructose or fruit so it is important to keep juices purely green. This will allow them to get a healthy dose of absorbable greens without feeding the SIBO with fructose. Green juice is an awesome supplement for anyone who struggles with digestive issues including SIBO. If you deal with constipation it can really help this annoying problem as well. To find more awesome recipes and green juice guidelines I also recommend checking out the green juice recipes page. While there are many other treatment strategies for managing and eliminating SIBO, feeding your body essential nutrients is important for the healing process. Author: Josh Sabourin is a gut health hacker and healthy lifestyle entrepreneur who created SIBOSurvivor.com. After dealing with a personal health crisis in his own life when he came down with a gastrointestinal condition called SIBO, he decided to dive into the natural health world for remedies.